On April 9, we will debut a simplified login experience for institutions who use a remote login method such as Proxy, Shibboleth, OpenAthens, or barcode to authenticate users into ProQuest (search.proquest.com/login). Through usage logs and customer feedback, it was clear that remote users were having a hard time connecting to ProQuest from the login page. The main reason for this was because they were confusing it with the ProQuest account login form, which for many users appeared to be the only authentication option on the page, while the link to access ProQuest remotely through their institution was less conspicuous and difficult for users to find. To reduce this confusion, we've redesigned the login page (search.proquest.com/login), as shown above, to make it easier for remote users to authenticate into ProQuest by adding the "Connect through your library or institution" form above the ProQuest account form. Further, remote users can select their institution on the login page, instead of having to click through to another page as they had to do previously. After the user selects their institution, they will be re-directed to their remote authentication method their institution set up with us. No technical adjustments are needed for this; the new login page will be enabled April 9 for all users who access ProQuest remotely. For customers whose users authenticate automatically by way of IP address or through a referring URL, they will continue to be authenticated into ProQuest as they have been. No additional sign-in is needed; this change applies only for those users who access ProQuest remotely. 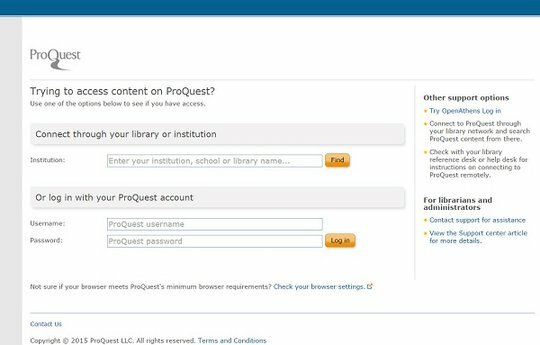 If you have any questions on about the new remote login experience, please contact ProQuest Technical Support for assistance.